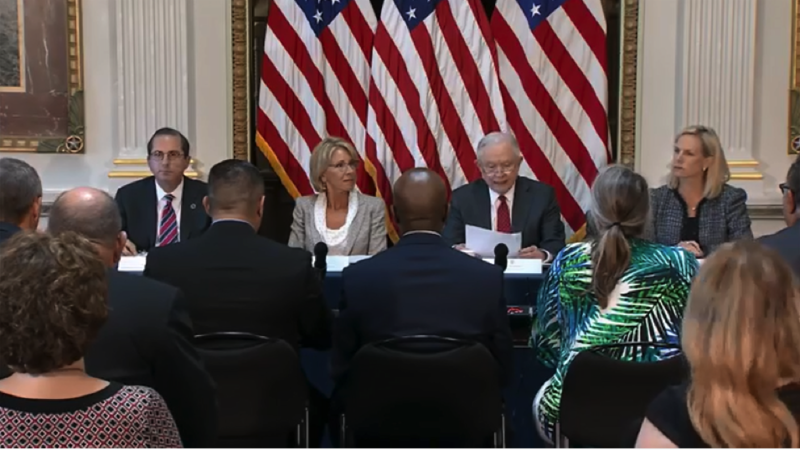 Readout of Commission Meeting on "Proactively Protecting Our Schools"
Attorney General Jeff Sessions hosted the fourth meeting of the Federal Commission on School Safety (FCSS) held July 26, 2018, at the Executive Office Building's Indian Treaty Room in Washington. The session examined the topic, "Proactively Protecting Our Schools." Attorney General Jeff Sessions delivers opening remarks at a meeting of the Federal Commission on School Safety. He's flanked by (l-r) Secretary of Health and Human Services Alex Azar, Secretary of Education Betsy DeVos and Secretary of Homeland Security Kirstjen M. Nielsen. Joining the Attorney General were commission Chair, Secretary of Education Betsy DeVos, and fellow members, Secretary of Health and Human Services Alex Azar and Secretary of Homeland Security Kirstjen M. Nielsen. "I'm grateful to the women and men of law enforcement who are with us today, as well as all those others that have dedicated their careers to working with our youth," Sessions said in opening remarks. "Through their decades of service, they have gained experience and expertise and judgment that is invaluable to any effort to reduce violence and crime in our schools." The meeting was livestreamed and is available for viewing here.